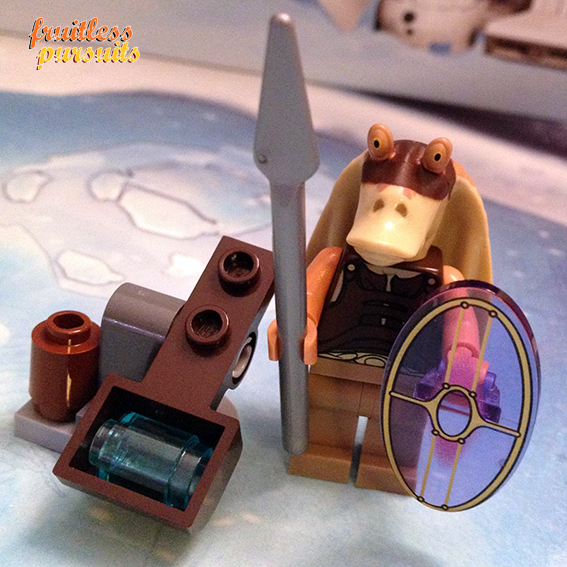 Fruitless Pursuits: Lego Star Wars Advent Calendar 2012, Day 3: Booma, Booma, Booma, Let’s Go Back to my Rooma! 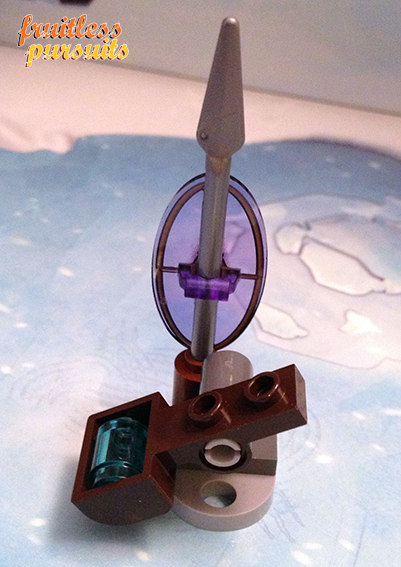 Lego Star Wars Advent Calendar 2012, Day 3: Booma, Booma, Booma, Let’s Go Back to my Rooma! We’ve had a mystery space guitar that turned out to be a submarine and a hapless halfwit/noble warrior gungan to ride it. 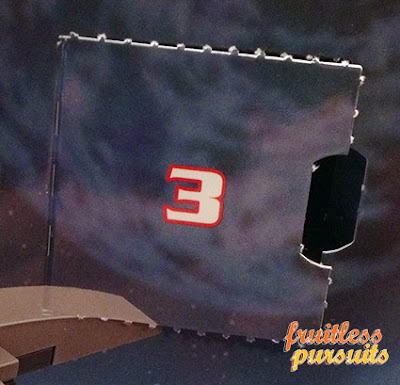 What other amazing surprises does the Lego Star Wars advent calendar have stored today in its generous cardboard belly? We’ll peel back Door #3... after the jump! Now I had a force premonition that, having received a sub and an unarmed gungan soldier, today we would be receiving his weaponry. Was the force strong with this one? Yes! Well... kind of. I expected his shield and spear, but wasn’t expecting the weapons rack to store them, or the mini catapult to launch glowing blue booma bombs at unsuspecting droids. Well played, Lego, it’s a nice touch! And we all like to be touched nicely. Especially at Christmas. The energy shield is to protect him from the cruel barbs of bitter middle-aged prequel haters that are still angry, 13 years later, that George Lucas made his Star Wars films for kids. Is there an agreed upon racial slur for gungans? Like sea-bunnies, or swamp-floppers, or chuba-lickers. I’m sensing a pattern here. I won’t be surprised if we get a vehicle, then a character associated with that vehicle, and then some accessories for that character, going forward. Which I’m cool with if that’s the case - at least there’ll be some synergy. Tune in tomorrow to see if I’m right! But I’m going to give my Playmobil Game of Thrones calendar the point today because it was badass!